Greenleaf Book Group, 9781626340541, 28pp. The Big Bad Wolf is back, and he's blowing down houses in the forest, one by one. The Three Little Pigs hatch a plan to help other animals weather the wolf's mighty lungs. They start a building company, offering strong homes built of brick, just like theirs. Demand is high for the brick homes the Pigs build, and their business becomes a success. Now they need to figure out what they should do with their hard-earned profits. One little Pig wants to spend away, another wants to give it away, and the third wants to save it. Based on the give-save-spend-concept, this sequel to the classic fairy tale teaches kids a safe and practical approach to managing money. Schools don t teach basic finance, and most books about money are too confusing for younger children. 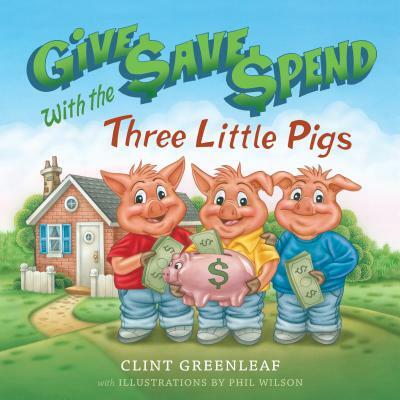 An entertaining first step in any child's education, "Give, Save, Spend with the Three Little Pigs" is easy to read and understand. Clint Greenleaf is the founder and CEO of Greenleaf Book Group. He sits on the University of Texas Libraries Board, blogs for Inc.com and CNN Money, and is a regular guest on Fox Business Network. He has been featured on Fox News, CNBC, CNN, MSBNC, and in the Wall Street Journal, Inc. magazine, Money magazine, Men s Health, Forbes, and Entrepreneur. Clint is also a certified public accountant and sits on the CNN Money Small Business Board of Directors. Clint speaks about publishing and entrepreneurship across the country and internationally at conferences, seminars, and schools. He lives in Austin, Texas, with his wife Kate and their three children."